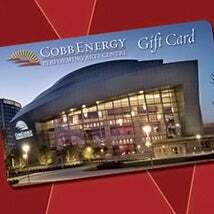 The Cobb Energy Centre gift card is a perfect way to give the gift of the arts. Gift cards may be purchased for any amount and are redeemable for any performance at the Centre. Gift cards may also be used for concessions. Gifts cards are available at the Synovus Box Office during operating hours.